End of Champagne Celebrations for wind industry in Ontario? 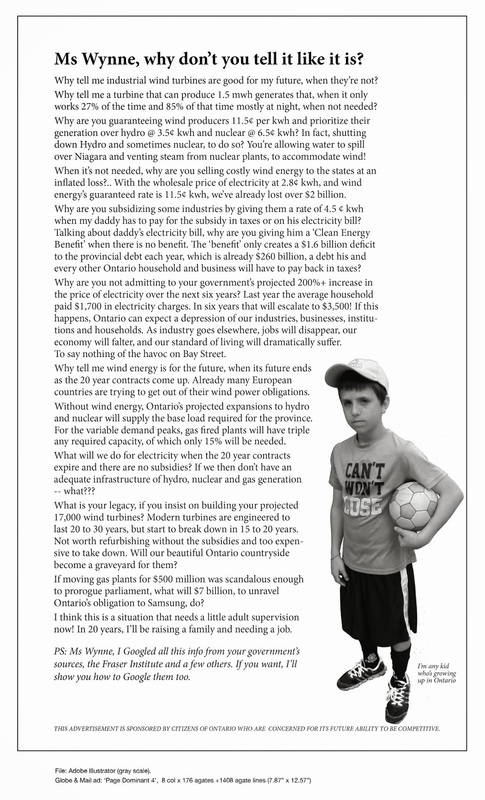 | Mothers Against Wind Turbines Inc.
End of Champagne Celebrations for wind industry in Ontario? SCHENECTADY, NEW YORK, UNITED STATES / TheNewswire / August 23rd, 2017 Wind Works Power Corp. (OTC:WWPW -News) is pleased to announce that it has completed its Ontario projects consisting of 24xSenvion 2MW MM100 turbines. Wind Works had developed the projects in Ontario and applied for and received the FIT contracts from the Ontario Power Authority in 2010. Wind Works joined forces with Capstone Infrastructure in a joint venture, which eventually acquired the remainder of the projects after commercial operation was achieved. The projects total 48MW and include the Wind Works projects Ganaraska, Grey Highland ZEP, Settlers Landing, and Snowy Ridge, all of which have achieved commercial operation. Wind Works has agreed with the government of Ontario to terminate the FIT contract applied for in 2009 and awarded in 2010 to the Cloudy Ridge project. The project received its REA permit from the Government of Ontario in December 2015. Wind Works had furthermore increased the interconnection deposit by approx. CAD $5.5M in December 2015 after HONI had previously changed the POI and PCC of the project due to other projects dropping out. Wind Works had also made down payments for 5 wind turbines from Senvion which have been manufactured and were awaiting onsite transport. Despite the late stage development process, given repeated governmental uncertainties, Wind Works was forced to terminate the FIT contract. Given that the government of Ontario recently cancelled the previously repeatedly announced second bidding process for up to 850 MW renewable energy, and given the loss incurred by Cloudy Ridge due to repeated governmental uncertainties, Wind Works has decided to terminate any activities in the uncertain and unpredictable Ontario renewable energy market. Consequently, WW has cancelled its previous plans to invest a further $300 Million in Ontario and to focus instead on the US market.